The Weber 18.5″ Smokey Mountain Cooker, stands 41″ tall when open, features a lid and bowl constructed of premium-grade U.S. steel and is coated with a baked on porcelain enamel. In addition to a lid-mounted temperature gauge, the cooker includes: Two plated-steel 18-½’’ diameter cooking grates, which provide ample room for smoking a turkey and a ham at the same time, Porcelain-enameled water pan that adds steam during the smoking process to keep meats tender and moist. A spring-latch, rust-resistant aluminum fuel door that makes adding charcoal, wood chunks or chips easy and convenient. 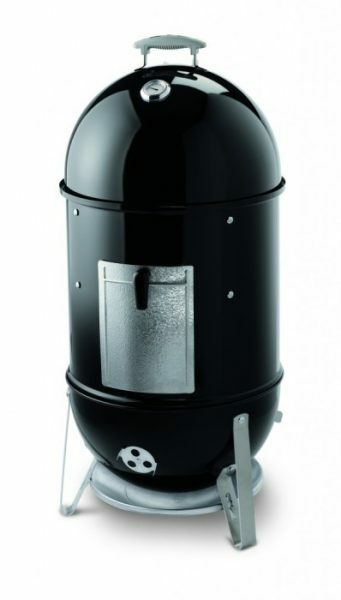 This Smokey Mountain Smoker/Cooker by Weber is sure to be the star of the next neighborhood cookout.